TBT! Walter Robinson was a part of our Lunchtime Lecture Series this past summer. This video was taken for a film by Paul Tschinkel entitled “Soho Stories” about the growing Soho art scene in the 1960′s. Robinson is an artist, editor, art critic, and was a part of the artist group CoLab which put together such shows as The Real Estate Show and The Times Square Show. 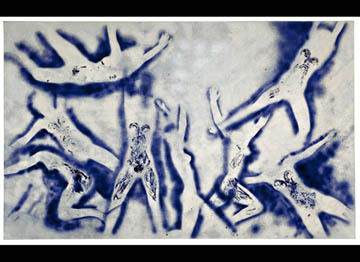 With the Void, Full Powers, an Yves Klein retrospective at the Walker Art Center opened on October 23rd. The exhibition runs through February 13th. Organized by the Walker Art Center and the Hirshhorn Museum and Sculpture Garden, Washington, DC, in collaboration with the Yves Klein Archives in Paris, Yves Klein: With the Void, Full Powers is the first major retrospective of the artist’s work in the United States in nearly 30 years. With some 200 pieces, including paintings, sculptures, drawings, documents, photographs, and films, it covers an impressive body of work that broke new ground and blended traditional artistic mediums with performance and spiritual exploration. The exhibition was curated by Phillippe Vergne and Kerry Brougher. Vergne will be a visiting lecturer for the MFA Art Practice Program.